When I was growing up, during the Sixties, my grandfather gave me four silver dollars- two 1921''s and two 1923''s. I, in turn, passed them on to my son, when he came of age. It''s just a shame that this watch can''t show the back of the coins, too. But it is still an incredible watch, and a great buy! An eye-catching unique timepiece for a great price that I really love to wear. Second watch I have bought from Stauer; like it even better than the last one. My wife bought me this watch for my birthday, and, for the price, we were not sure what to expect; but the watch is beautifully made and is a real conversation piece (keeps great time as well). Everyone I have showed it to thought it cost hundreds more. I recieved my watch 4/29/11 and I was floored on how great it looks, I have recieved alot of compliments on how beautiful it is. Thanks Stauer for making such a great looking watch, I''m very happy with my purchase. I bought this recently and fell in love with it! A bit bigger than I expected but I LOVE IT!! Everyone thinks that it costs more than it looks! I saved up for it and I am very impressed. Would like to have been able to have a clear back to see the back of the coin but I am pleased!! Great to look at love the watch Makes me feel special. Thank you. This beautiful (very suitable for evening dress-wear) watch is a precious example of the numismatic history of the United States. 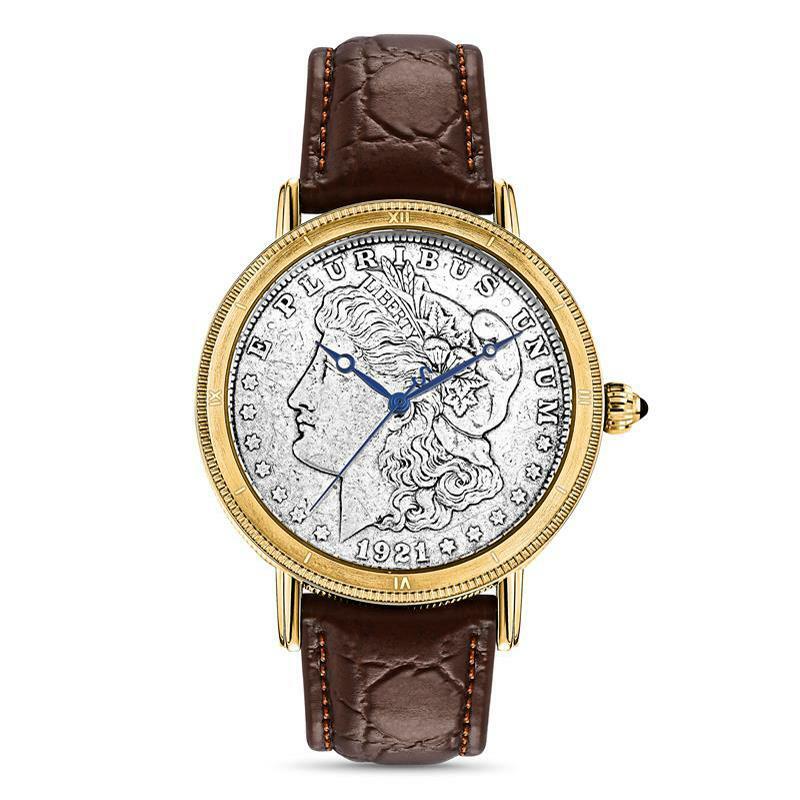 It is not only a great conversation piece; but also it is the only watch I own that will iocrease in value every year -- because it contains an original 1921 Morgan Silver Dollar. Your (male) &quot;significant other&quot; will be overjoyed to receive such a perfect gift. I promise you will be very satisfied &quot;this time&quot;. I''ve wanted this watch for years. My wife just got me one for Christmas and it is more beautiful than I imagined. The Morgan dollar is in pristine condition and the strap adds the perfect amount of class. I''ve only worn it a couple of times but have already gotten several compliments! 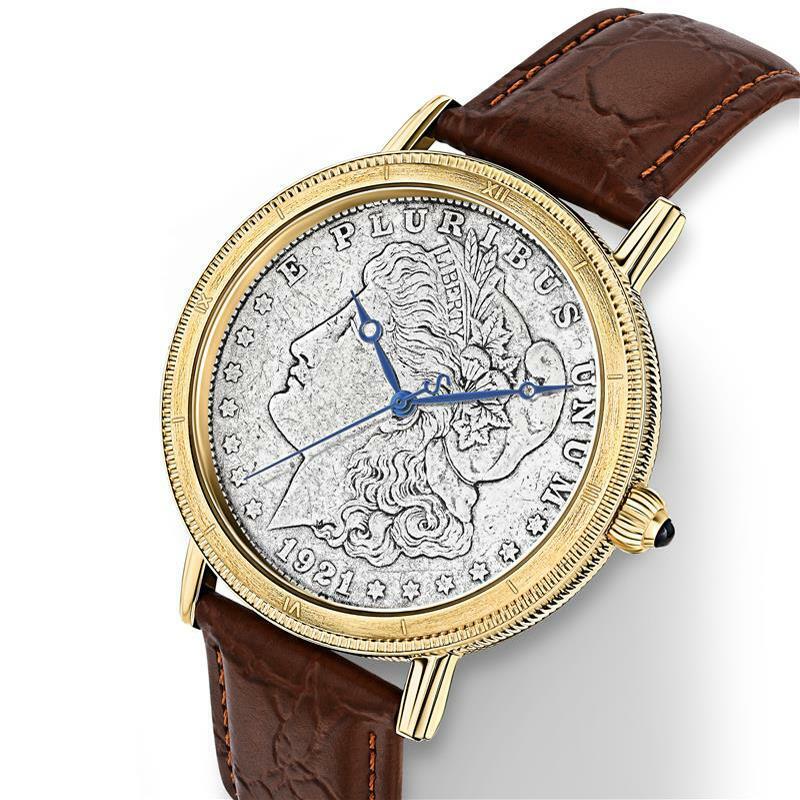 I would recommend this watch to any numismatist looking for a striking and elegant timepiece. This watch gets all the compliments. I love showing it off! It is a very elegant time piece. I guess I got a pretty good year! I purchased this watch for my husband to celebrate our 30th Wedding Anniversary and it was a HUGE hit! 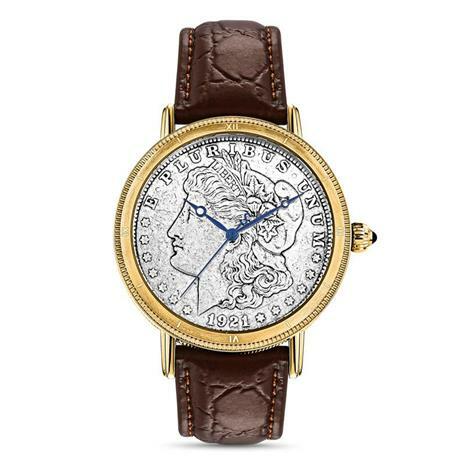 My husband collects watches and I have found many in our three decades together that he has enjoyed owning...but since he also collects old coins this watch was the perfect gift to commemorate reaching our 30th year together. I recommend this watch to anyone that loves unique time pieces. Glad to see Stauer breaking out of their 39mm rut. Tiny watches don''t do it for men who like to announce that they have arrived. This 45mm watch is a larger watch and harkens back the day when Corum produced the gold coin watch for the discriminating consumer. Let''s have, let''s see more of these larger watches that can compete in size at least come close in size with my 48mm Breitling Super Avenger. I bought this watch about a year and a half ago. It has worked well, and it looks good on my wrist. I like the fact that it has a large face to see the time from a distance, and it has a second hand. I get a lot of compliments on the watch. I am very glad I bought it. Jeweler who replaced the Quartz movement for $80. It is now working again and looking good on my wrist. As a numismatist for over 30 years, I could never find a watch that both filled my need as a watch and the collector side of my interest. When I saw this, I made my mind up immediately. Very pleased with the purchase. Back in 1921, America experienced the first radio broadcast of a baseball game. Valentino wooed audiences as "The Sheik" on the big screen. A scruffy scientist named Einstein won the Nobel Prize in Physics. And if you slipped into a speakeasy, it's likely you slapped a Morgan Silver Dollar onto the bar to pay for that forbidden nip of whiskey. One of the most widely desired of all U.S. coins — the Morgan Silver Dollar has become a legend. It's easy to see why—the largest silver currency ever to circulate in the United States, Morgan dollars are 90% silver. Now, the master watchmakers at Stauer have combined this beloved coin with a legendary Swiss movement to create a remarkable timepiece.